On our last night in hospital (Day 3-4) the girls again went to the nursery for the night as it was still taking me forever to be able to shuffle in and out of bed. (Those staples are a killer.) My night nurse (again Asian) was trying to get me to take another dose of the strong pain killers so I’d have a good night’s sleep but since I didn’t want to be too doped up, and I was planning to get a dose first thing in the morning so I refused. Silly me because at about 11pm my room mate moved in avec chatty husband and newborn. Roomie was famished so her husband went out to get her food, he was gone for about 30-40 minutes and he returned with a full week’s grocery shop. I kid you not. If I could have taken a sneaky photo I would have it was crazy. There were half a dozen or more grocery bags all over her half of the room, and I’m not quite sure her husband was thinking when he bought EVERYTHING in at least three stores but bless. I was probably just jealous because I still had not gotten my appetite back. So that night I tried to sleep to the background noise of munch, munch, munch, rustle, rustle, rustle, and stage whispering between husband and wife. The other noise you get use to in hospital is the orchestra of electric beds that play all night. The next morning, and by morning I mean 5am of course, the girls were wheeled in to me to see if I could get them to latch on (but I’d already made the decision to embrace formula entirely) and I immediately got my nurse to bring me the strong pain meds so I could start the day. By the time the attending showed up I was feeling mobile enough to cuddle my girls and shuffle back and forth to the bathroom (very important to keep peeing), and it didn’t really hurt having my staples out. The attending gave me a prescription for the strong pain meds, and wished me well. This was the first step to our escape! I had hoped that breakfast would arrive before my girls woke up, and my OBGYN turned up to discharge me but of course everything/one arrived with-in 5-10 minutes of each other. I was gulping down raisin bran, and mint tea as my OBGYN arrived at 8am. She was very happy with how I was healing, gave me some instructions (which I sort of forgot) and reminded me to get her a photo of the girls to go on her baby wall. 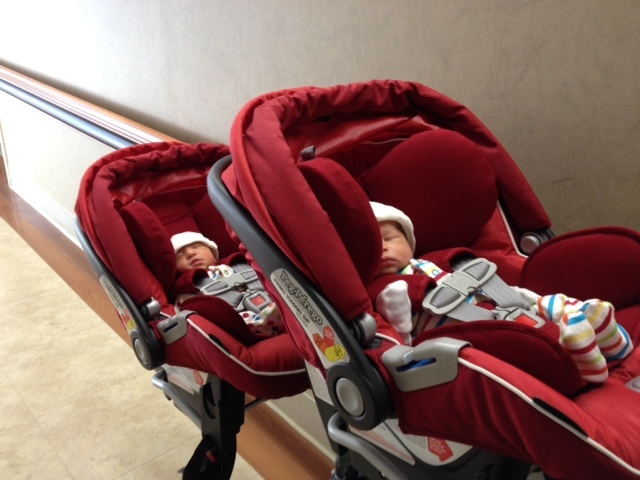 Next up was just needing the pediatrician to discharge the girls, and then we could make a break for it. Alex arrived at 8:30am just as the pediatrician arrived, and the girls were good to go. I was given the breast feeding and formula talk again. Formula was fine but if I wanted to breastfeed I would have to cut back on the formula and work hard with a lactation consultant. I felt teary, a bit of a failure but I knew in the long time that we’d made the right decision for everyone in our family. We started to pack up all the diapers and formula we’d stockpiled, and waited for the nurses to come with the discharge papers. This is where our docile girls started to get super grumpy. There was just too much going on in our half of the room, and too many visitors. It took us a good hour to get through the paperwork, finish packing (we had a LOT of formula and diapers), dress the girls and put them in their cylon raider. The drive home was the slowest I’d ever seen Alex drive, and it felt so good to be going home as a family!